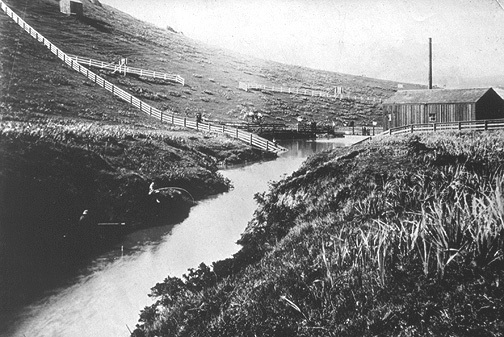 Islais Creek emerging from Glen Canyon, 1890s. 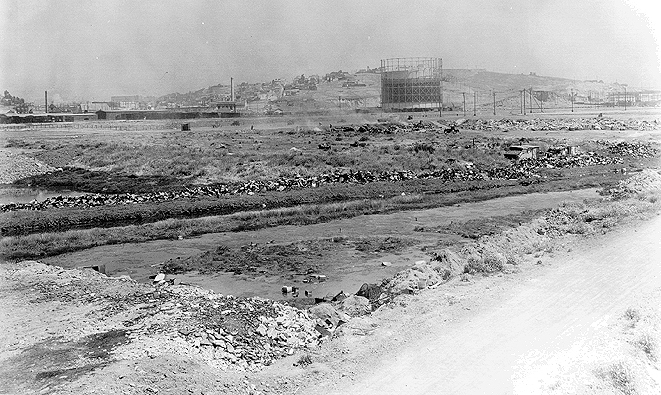 View of Islais Creek in 1918 disappearing into culvert in 1918, not far from the Geneva Car barn. Sutro Forest covers part of Mt. Davidson in upper left. 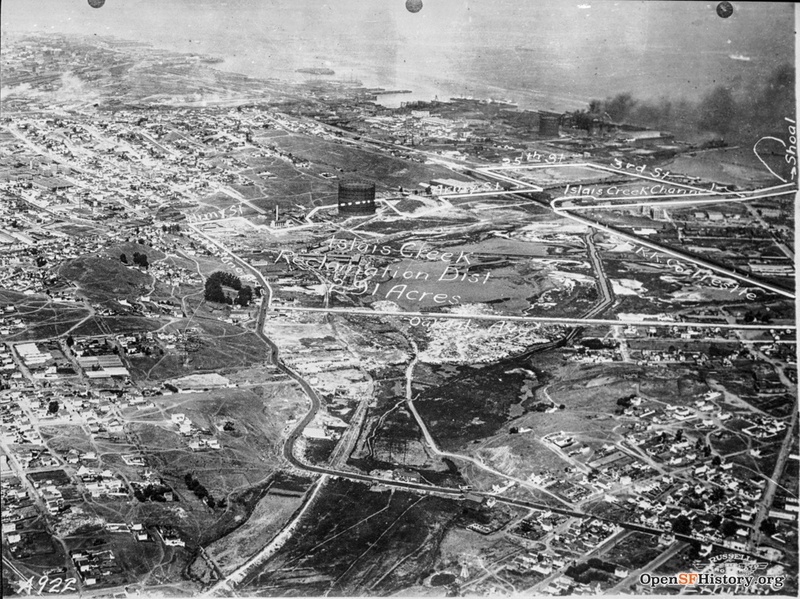 1920's image of the Islais Creek Reclamation District which has become the industrial zone between Bayshore Blvd. and 3rd Street. "Islais Creek fascinated us. Located east of what is today Highway 280, this huge area of marshland, full of numerous stagnant ponds and junk of all kinds, fed by streams of water from the hills, attracted us as a magnet does a nail. It was in this marshland that we boys would go rafting, sailing the malodorous waters as though we were jolly tars on the Spanish Main. "One particular Saturday morning disaster struck when I accidentally fell into the pond from a makeshift raft. I was soaked through and through. My companions, anxious to help me, rigged up a makeshift clothesline. I took off my wet clothes and draped them across the line. Just where and how they found the rope and material to make a clothesline I will never know. At that sad moment I had no desire to make inquiries. "To accelerate the drying of my garments they built a merry fire under them. That was when the BIG trouble started. My clothing caught on fire. Oh what a lovely fire my attire made! By sheer luck I managed to rescue my trousers and shoes. "Today that area is built up. So much the better. A cousin of my mother's, many years ago, was brought home dead after drowning in a pond in Islais Creek." 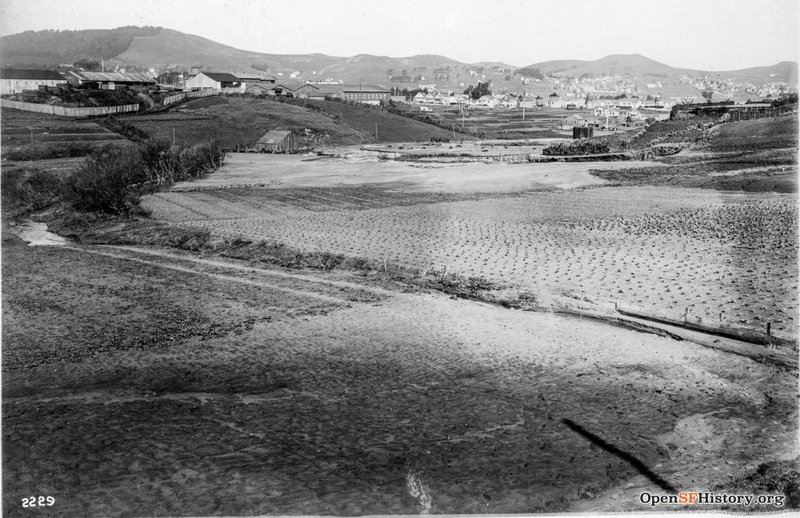 Islais Creek was fed, in part, by a stream that flowed down from the hills by way of what is today Alemany Boulevard. It was in this creek that we boys would catch pollywogs and bring them home, much to the consternation of our mothers. Mothers failed to find the creatures to be an adornment to their households. Today that stream is a busy highway carrying a heavy stream of automotive traffic. --Excerpted from Frank R. Quinn's 1984 memoir, Growing Up in the Mission. 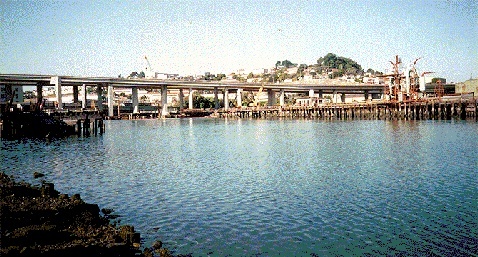 Islais Creek is now an estuary with I-280 passing over it. 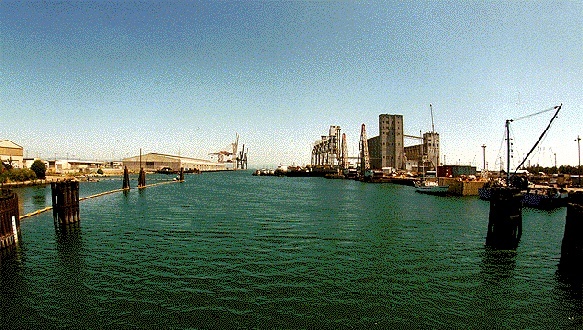 The old Copra loading dock is visible on the right side of this image from 1996. 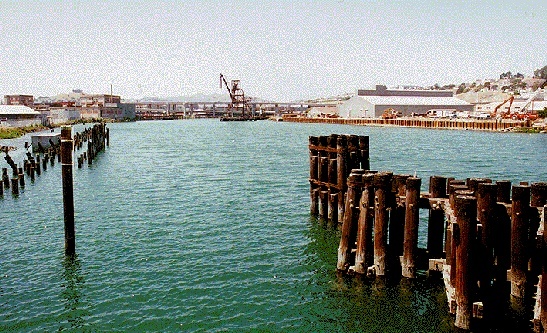 Islais Creek in the mid-1990s looking west.